I’ve been writing articles on why nitrogen in your tires is a waste of money for several years, but It has had very little effect on the number of car dealers that are selling it to their customers. Just last week, I received a text from a listener to my radio show disputing the fact that nitrogen is worthless for auto tires. The “Nitrogen Lobby” must be very powerful because we still have no federal or state legislation to curtail this. Selling nitrogen generation equipment and tanks of nitrogen to car dealers is very lucrative and, even more lucrative is the money car dealers make selling nitrogen to their customers. 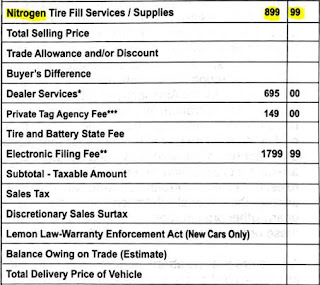 One large volume car dealer charges $899.99 for nitrogen in the tires of every vehicle he sells (August 2017). The cost of nitrogen is about “25 cents” per application. 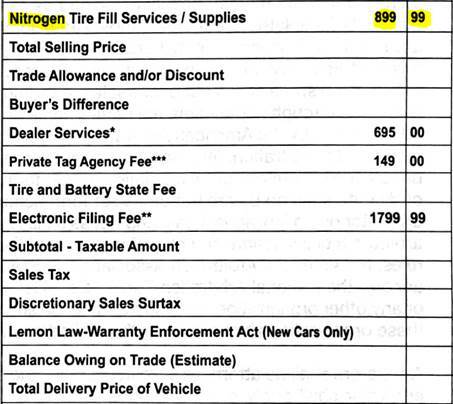 If you feel you absolutely must have nitrogen in your tires, Costco will give it to you for nothing which is exactly what nitrogen in your tires is worth. Costco reason for this is to encourage you to come back for more free nitrogen so that they can sell you a rotate, balance, and another set of tires. I don’t recommend that you even accept free nitrogen for this reason. It’s widely accepted and recommended that you should have your tire pressure checked in your tires at least monthly. We do this free for our customers and automatically do it at every service visit. When you are sold or even given nitrogen, it comes with a sales pitch that nitrogen will remain in your tires for a much longer time than air which is not true. Click on this link to Consumer Reports article,www.NitrogenInTiresWastesYourMoney.com. If you believe the sales pitch, you’re less likely to check your tires inflation every 30 days. You may have a slow leak in one tire from a nail or screw, uneven wear from misalignment, or even a defective tire. Being “over confident” because you paid money for nitrogen may cause these problems to go undetected. Consumer Reports estimates that 1 lb. of nitrogen will escape from your tires every 3 months vs. 1 month for air. Remember that air is 78% nitrogen. I’ll bet the salesman that sells you nitrogen “forgot” to tell you that. To be perfectly fair, I must say that some car dealers that are selling nitrogen have “drunk the Kool Ade” from the nitrogen generation equipment industry. Some car dealers believe that nitrogen is good for your tires. But those who do know must know how much they’re marking up that 25 cents worth of nitrogen they’re selling you! The argument for nitrogen can be persuasive. In fact, when the concept was first introduced, before the Consumer Reports study, I considered adding nitrogen to my customers’ tires. But, in an abundance of caution, I decided to test the claims about nitrogen myself. Over a six-month period I used pure nitrogen in 50% of my rental car fleet and regular air (78% nitrogen) in the other half. Guess what! There was no measurable difference between the pure nitrogen and air-filled tires in the fuel economy, tire wear, or inflation pressure after 6 months. We did check the tires every 30 days for slow leaks from road hazards, uneven wear from misalignment or other reasons, and we rotated and balanced the tires every 5,000 miles. Finally, I’ll tell you why I was so careful to be sure there was no advantage to nitrogen. My dealership has a “free tire program”. Everybody who buys a Toyota from me, new or certified used, receives free tires (maximum of $700 per set) for as long as they own their car. The one requirement is that they bring their car back to me for the factory recommended service and we replace only tires from normal wear, not road hazards, underinflating or misalignment. I give away in excess of $100,000 worth of tires every month, well over a million dollars per year. BELIEVE ME, if I thought I could get longer wear from a tire for “25 cents” worth of nitrogen, I would! I look at the tires on my customers’ cars as “belonging to me” because I incur the cost of replacing them when they wear out.